Living in a converted shipping container has prevailed as a concept that is increasingly gaining popularity. The flexible, adaptable design combines the environmentally friendly idea of recycling with the requirements of modern urban planning. Artdepartment Berlin has contributed a substantial part of this development with its brand 2x20ft. Our designs disprove the possible objections that residential containers are too small, too hot, too cold or too little soundproofed. In cooperation with Livingcontainer GmbH, we have designed modern container dormitories that meet the requirements of a young, urban lifestyle in every respect. They provide both privacy and space for the development of individual ideas, as well as the opportunity to participate in community life. Container apartments also provide a comfort that student residences often lack: separate bathrooms and kitchens for each unit, separate bedrooms and study rooms, balconies and large windows providing daylight and views. Container housing systems are an ideal solution for affordable living with a high living quality. They can be quickly and easily assembled and dismantled and are thus suitable both as permanent structures and for the temporary use of urban fallow land. We have therefore opted for a module-like design, which can stand for itself but can also be extended to a multiple of the original size at any time. 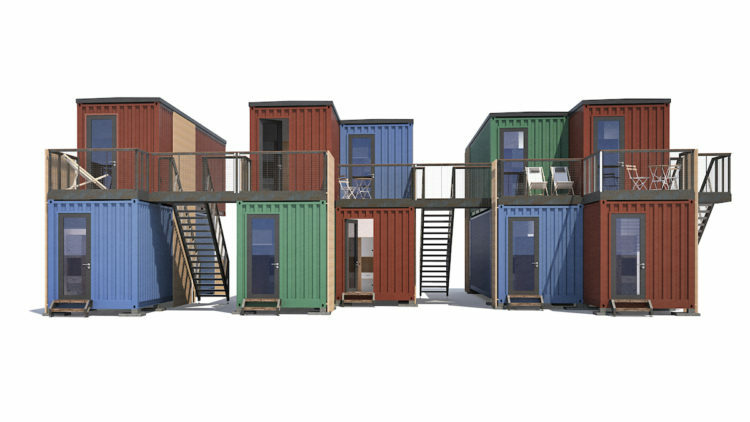 Suitable as student residences, family apartments or apartment hotels, the possible uses of container housing systems are surprisingly diverse.